I [Paul] thank God that I speak in tongues more than any of you. A special ability from the Holy Spirit to speak in a language never learned: earthly or angelic. Unintelligible speech directed in praise and prayer toward God for the edification of the speaker and for the building up of the people of God. Speaking in tongues is normal, but not normative. 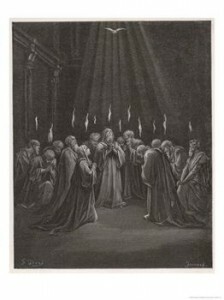 That is to say, do not be surprised to experience the gift of tongues upon being renewed in the Holy Spirit. However, the experience of this blessed gift is not a requirement, but a grace-gift from God to assist us in praying when we do not know how to pray. (1 Cor. 13:1, Gen. 11:1-9, Acts 2:1-11). The gift of tongues cuts at our pride. Receiving this gift surrenders our speech to the Lord and makes us like little children: humble, dependent and trusting. The gift places us in unfamiliar territory and requires us to be childlike in prayer. But this may be why tongues are important. It is a means God uses to challenge strategies of control. It is a humble but also a humbling gift to which we should be open. Clark H. Pinnock, Flame of Love: A Theology of the Holy Spirit (Downers Grove, IL: InterVarsity Press, 1996), 172-173. This entry was posted in Charismatic Movement, Holy Spirit, Spiritual Gifts, Tongues and tagged Charismatic Movement, Holy Spirit, Spiritual Gifts, Tongues on May 12, 2009 by GlennDavis.